Mimosa is a name given to many different plants, sometimes scientifically to a precise group of plants in the pea family (Fabaceae), and other times as a name used colloquially in a geographic region for a mimosa-like flowering plant. What all these plants have in common is that their ornamental foliages are feather-like and the flowers are puffy or pompom-like, regardless of size. Sensitive plant, Mimosa pudica, is one plant commonly called mimosa. Its botanical or scientific name reveals this is a "true" mimosa, as it belongs to the genus Mimosa. It is native to tropical America and is world renowned for the folding up of its feather-like foliage when touched, giving it a common name of sensitive plant. The foliage also folds up in the darkness of night. The pink flowers of the sensitive plant are held on the tips of stems in the warmth of spring and summer, and resemble tiny pompoms, no larger than 1/2-inch. Sunshine mimosa or puffy pink powderpuff, Mimosa strigillosa, is a sprawling groundcover native to the southeastern United States. Its scientific name reveals it, too, is a "true" mimosa, as it belongs to the genus Mimosa, as well. The foliage is feathery, with many small leaflets and produces small purplish pink tufts of flowers in summer that look like bottlebrushes or pompoms. It is sometimes used as an alternative to turf grass in lawns. The mimosa tree or silk tree, Albizia julibrissin, is a fast-growing plant native to southern Asia. The foliage is feathery in shape and visual texture, filling its drooping branches. In early summer, tufts of rounded, puffy pink, rose or fully white flowers grace the ends of branches. The flowers, once pollinated by bees, form large seed pods that split open and drop to the ground and then germinate. This tendency to produce copious amounts of seedlings is a primary reason this tree is regarded as undesirable or invasive in many parts of the world, albeit quite ornamental. 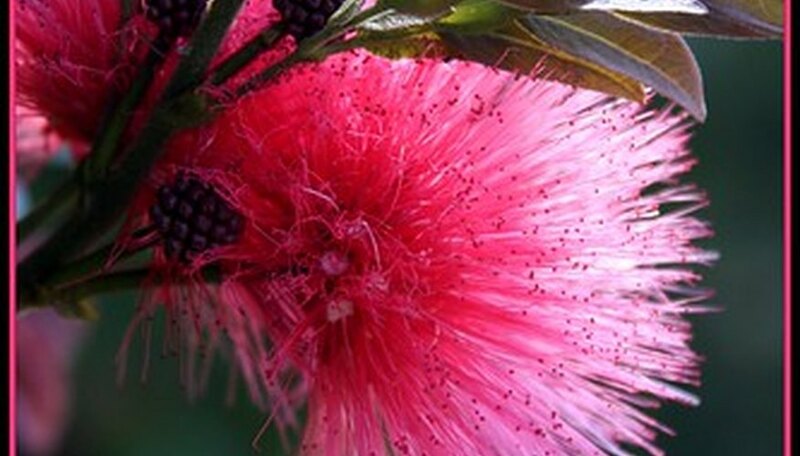 Houston's powderpuff, Calliandra houstoniana, was formerly known by the scientific name Mimosa houstoniana. The foliage and flowers of the botanical genus, or group, Calliandra, greatly resemble those of the genus Mimosa. Thus, many gardeners will loosely call any Calliandra species a mimosa, as well as the more common name of powderpuff. Houston's powderpuff is native to Central America and is a large shrub to small tree that has feathery foliage. It flowers anytime from late summer to the following spring, with spire-like flowers that have whisker-like whorls of pinkish red stamens. In Europe, flowers of the botanical genus Acacia are commonly called mimosa. Often, they are encountered as cut flowers, regarded for their brilliant, puffy flower heads of yellow. Golden mimosa (Acacia baileyana) and silver wattle (Acacia dealbata) are two popular species of Acacia loved in southern Europe for floral bouquets. Interestingly, these two plant species are native to Australia, where each is commonly called "wattle," not mimosa.